Have you thought about taking up the Laundry Pod Challenge? Don’t. Just a few weeks ago, YouTube was abuzz with videos of teens eating laundry pods. But the video-sharing site is now committed to taking them down. The reason? Eating laundry pods is extremely dangerous - even potentially deadly. So what exactly are laundry pods, and what makes them so dangerous? First, let’s look at how detergent works. Detergent is made up of molecules called surfactants. These molecules have two ends. One end is hydrophilic (water-loving) and the other is hydrophobic (water-hating). The hydrophilic end can dissolve in water. That’s because it can form bonds with the hydrogen in water (H2O). Meanwhile, the hydrophobic end can’t. Instead, it dissolves in oily surfaces. How does this play out in your laundry machine? 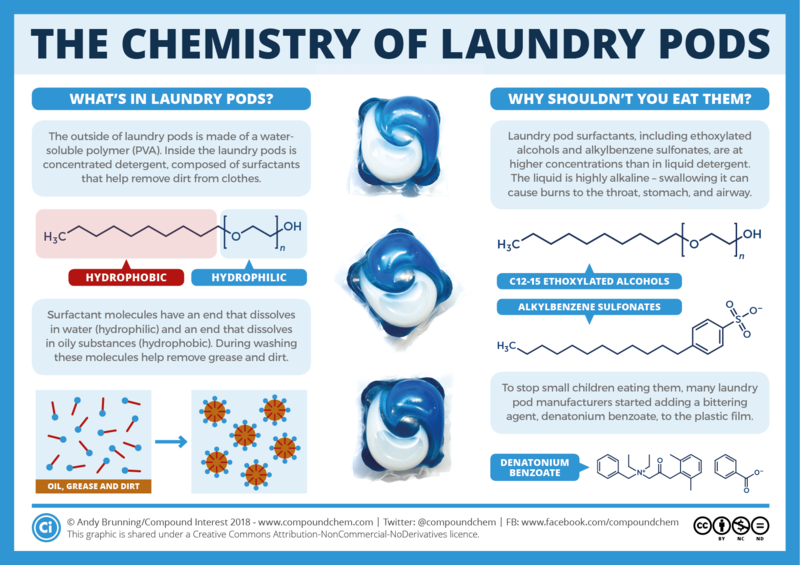 Well, one end of the surfactant molecule sticks to the dirt on your laundry. The other dissolves in water. Together, they pull the dirt away by lowering the attraction of the dirt molecules to your clothes. A similar process happens when you wash your hands with soap. Detergents are also alkaline (basic). Bases measure above 7 on the pH scale. Basic substances bond easily with hydrogen ions. They also react with oils and fats. That makes them great at removing dirt and stains. Did you know? Some detergents contain compounds that absorb UV light, then emit it as blue light. This has a whitening effect. It’s the reason your white clothes stay white! So what does all this have to do with your body? Bases can cause burns. The detergent in laundry pods is at a higher concentration than other types of laundry detergent. This means that it’s even more concentrated than some of the liquids or powders you may use to wash your clothes. So what would happen if you swallowed an extremely concentrated basic substance? You guessed it: you’d possibly burn your throat and your stomach! That’s not all. What if you accidentally inhaled the detergent in a laundry pod? It could possibly burn your airway and your lungs! The other possible risks are extremely serious, too: seizures, comas and even death. All of that is just what scientists know about laundry pods. There are other dangerous effects they don’t know about, either. For example, some teens who have eaten laundry pods end up feeling drowsy and having trouble breathing. Scientists suspect this is an effect of chemicals in some laundry pods, but they don’t yet know which chemicals. How is the laundry detergent industry responding to all this? Some manufacturers have been adding a bittering agent called denatonium benzoate to the pod’s plastic film. So not only are laundry pods deadly, but they also taste horrible, too. But this measure doesn’t seem to be working. That’s why some people are going a step further. They’re urging manufacturers to stop producing laundry pods altogether. Did you know? Denatonium benzoate is the most bitter chemical compound scientists know about. It’s added to other deadly-to-swallow substances, like antifreeze. If anyone you know ingests a laundry pod, get help immediately. Call your nearest poison control centre or 911 for advice. And be prepared to get them to a hospital! Better yet: if someone you know wants to take up the Tide Pod Challenge, tell them not to do it. Try a safe science experiment instead! Should laundry pod manufacturers be held responsible when people use their product in a way it was not intended? Explain. Should social media platforms allow teens to share videos of people doing dangerous activities? Why/why not? What properties of the teenage brain makes teenagers susceptible to dangerous activities such as this?